The TOS Homeschool Review Crew had the chance to check out the I See Sam readers from Academic Success for All Learners last year, and I was disappointed to not be able to be a part of that. However, a friend gave me some of her books (sets 1-4) as she thought they could be a good fit for my family. I kept meaning to pull them out and actually try them, but something always seemed to come up. Then, it was announced to the TOS Crew that we'd have the chance to review this series again, and that now there was an online placement test, and we could choose which sets we wanted based on that test. You better believe that got my attention. Checking out the website, I realized that Trina would probably just barely not pass the first test, so I didn't bother. Richard sat for the tests though, and it really was a great experience for me. He ended up scoring right on the border as to whether he should start with set 5, or start with set 4. Since we owned set 4, I opted to start him there while I waited to find out if I'd be one of the lucky few to be chosen to do this review. I opted not to put Thomas through the placement tests, but once our materials arrived (sets 5 and 6), I did decide to casually work through set 6 with him. So, if you weren't keeping notes, that meant I had children working in sets 1, 4-5 and 6. 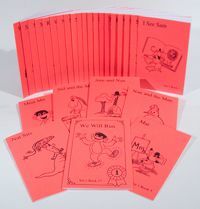 The Little Books program (commonly known as the I See Sam books) is a series of eight color-coded sets of "little" books. Each set includes between 27 books (Sets 1 and 2) and 10 books (Set 8). As you move along, the stories get longer, and there are more than one in an individual book. These go from a kindergarten to a third grade reading level. Let's take a look at the experiences my kids had, just to get a feel for how the program works. Trina started in Set 1. This is the only set I had actually looked at before, and it never truly impressed me. The first book can be read with only the words "I," "see," and "Sam." Not exactly gripping literature. The illustrations do the bulk of the work in moving the plot forward, but yikes. Dull for Mom. Trina, however, loved that she could sit down and read a whole book all by herself. The stories get more "real" as you work through the level, fortunately. Let's take Book 20: Nat Sits, and use that to illustrate the basics of how this program works. Each book starts off with sound practice. Trina had to be able to read all the sounds correctly, including: e, Th, wh, W, t, N, f, th, w, etc. I loved that Th and th were both included. Some books (not this one) will then introduce new sounds. Each book has word practice. For this book, that included words like Will, mess, We, when, with, will, etc. Again, words such as "We" and "we" are both included. Love that. Again, she has to get them all right in order to move on. Most books have New Words, which she sounds out, and once she gets them all right, we move on again. In this book, that includes fit, fits, Nat and Sits. The the story. There aren't many words to a page, and the illustrations help carry the plot along. At the bottom of each page, there is small text to the teacher -- some with comprehension questions, some just reminding me to praise her for a job well done. One of the longer pages of the story is: "Nat! Nat! Nat sits in this. Nat fits in this." The student is to read through the story at least twice. After the story, there is a page for "Coming Attractions!" where you get a chance to try out the new sounds and new words for the next book. What I love about Level 1 is that words are introduced slowly and logically. The text is not quite as predictable as you would think. The pictures might help you figure out what is going on in general, but they don't necessarily help you to decode the words. Set 4 is where Richard started. He moved pretty quickly, and also worked in Set 5. I'll focus here on Set 4 though. This set contains fewer books (15) but each book has two stories. The format was similar (sound practice, new sounds sometimes, word practice, new words) but there were also other little "drill" activities in the "Preparing for Success" sections before the stories. Specifically, there would be exercises dealing with silent e. These drills were scripted, and Richard hated them. But the point was to stop and notice those e's at the end of a word and to figure out what that means to the rest of the word. There were also drills relating to the /k/ or /s/ sounds of "c" and the /g/ and /j/ sounds of "g." Or which sound the -ed ending would make in a word. I loved how these exercises were done. These drill exercises totally sold me on the program. I'm tempted to make my 7th grader (severely dyslexic) go through and do all the drill exercises from the beginning, they are that good. He'd have a major attitude about it though. The stories are far more interesting at this point. These stories would generally have one partial page illustration per two-page spread, and a lot more words on a page. A sentence from one of the later books in this set: "Then I will send freezing waves to sink you," said the Man of Ice. Why do the ants run to get the ham? -inference question. I love that there are a variety of question types, particularly the inference ones. Most of the time, in beginning readers, any comprehension questions are very fact based. Thomas worked in Set 6. This was pretty easy for him, but it gave me the chance to reinforce some rules. Set 6 consists of 13 books with four stories in each book, and it is very similar to the Set 4 books, except the stories are longer, and now there are pictures every 2-3 pages. The drill still does things like working with silent e, but now it is with words like change, else and taste. Thomas thought these were a bit too young for him, but he did find himself interested in the storyline in spite of himself. And that works for me. I like these. A lot. They worked for my struggling reader. They worked incredibly well for my self-taught 2nd grade reader. They worked well for my barely past beginning reader. the stories are interesting. At least for the kids. Not always for the mom. These books have taken Richard from being an early reader totally lacking confidence to a child who reads constantly: billboards, milk cartons, or my emails over my shoulder. He still isn't reading everything, but this has given him the tools to try to figure it out. And I'm confident that by the time he works through Set 8, he'll be ready to tackle practically anything. The sets are available for $30 each, and I will be looking to purchase sets 7 and 8. Disclaimer: As part of the TOS Homeschool Review Crew, I did receive sets 5 and 6 of the Little Books for the purposes of a review. I already owned sets 1-4. All opinions are my own. For more about my take on reviews, visit my blog post here. My youngest certainly enjoyed the Little Books, as well. I can see I will be purchasing the rest of the sets, too; just not all at once! It was great being able to see how the different levels work/look, in your review.